Have you ever try boarding the train towards Raffles Place MRT during the morning peak hours especially between 7.30am to 8.30am. I’m sure the photo below might shed some lights. 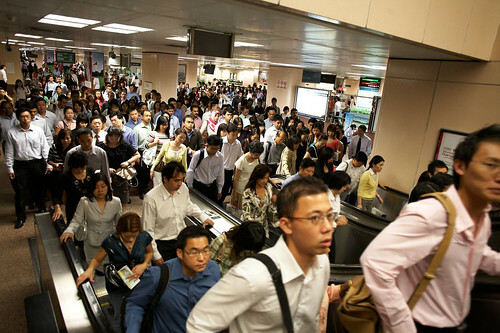 The question is how do you get Singapore commuters to travel during the off-peak periods? Well the researchers from NUS and Stanford University are working on a study which aims to encourage off-peak commute on the train network in Singapore. Through the “Incentives for Singapore’s Commuters” (INSINC) website, commuters can sign up via their ez-link cards to earn credits based on the distance they travel on the Mass Rapid Transit and Light Rail Transit. Extra credits are granted for shoulder-peak trips. In my opinion I think INSINC is gamification of Public Transportation at it’s finest (at least in Singapore). It’s almost like – Can I pay you to take a later train instead of the one at 8am? beside money, what better way can you find to reward human errrr or should I say Singaporeans ? *Am bootstrapping for a startup now, so each cent means so much to me. If you noticed, I got all my rewards from “SPIN“. During the sign up process, you get to chose how you want to redeem your credits. Or you can do a Cash Buyout where the current exchange rate is $1 for every 1,000 credits – safe! I got most of my credits from spinning on this game. Now for the interesting part of the platform. How do you get more credits. How I earned my credits? I earned most of my credits from referring my friends to signup. Each signup gives me 250 credits and for every 25 credits (range from 15~35) I get 1 chance to SPIN. This means that for every friend that you invite to signup you get 10 chances to play SPIN. So the more people you invite the more credits you get. How much money have been given out. My $17.00 is just a small part of it. These are the stats for the rewards as of 19 April 2012. I shared with you my bargain finding, I wished you good luck and win lots of money! Or if you like to thank me for sharing such good lobang 😀 you can sign up here and I could get 250 credits for each signup. So good luck, Win More. Next Post Try Google Drive… Only If You Only Got 2GB From DropBox. Pingback: Gamification of Dual Tasks Paradigm | Could we use concept of Gamification on the Public Transportation?